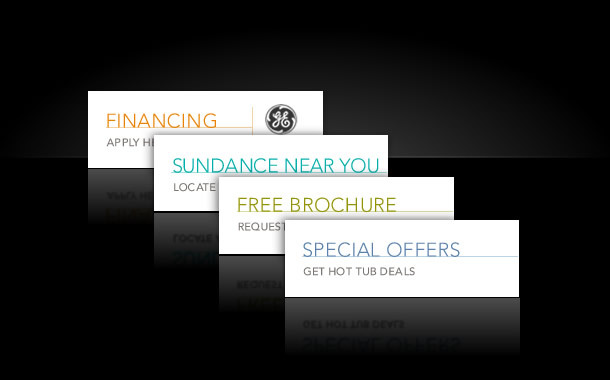 Sundance Spas’ website is a great example of designing for the web with conversion goals in mind. Once these calls to action were identified, we were able to move forward with design and development based on a sound conversion strategy. As you can see, we’ve turned the right navigation channel into a conversion tool, with a focus on financing options, locating a Sundance dealer, special offers, get a quote, requesting a free brochure, and an email sign up form. Additionally, this channel contains links to stay connected via social media and subscribing to their blog. One important aspect of this conversion channel, is that it stays in the same place and is consistent throughout the site. With clearly defined calls to action on each page, users are only a click away from a conversion goal no matter where they are in the site, which means whenever a user is ready to request additional information, Sundance is ready to provide it. Making your goals clear and accessible for site visitors is the most important first step you can take to start increasing your conversion rates.